A life without a computer wouldn’t exactly be strange. I’ve gone through it before. Years before I even thought of having a blog or personal video account, life was pretty low key, pretty standard. Still got the TV. Still got basic cable. Still got the Blu-ray player loaded with Netflix, YouTube, and Pandora Radio, so I wouldn’t be completely cut off. If I didn’t have my laptop, there would still be the local library to go to. I’m not fond of using a desktop anymore but it would work, even if the mobile luxury wouldn’t be there. The moon and the stars would still be in the sky if my computer wasn’t here. Life would go on as usual. My online life may take a leave of absence but I would still be me, still be the dude with the messy hair and habit of cracking his fingers. Things would be even more quieter than usual. I’d be sitting on this couch of mine right now, just staring ahead at the room, listening to that cat yowl, seeing everything stay pretty much the same. The life would be less technological and more sociable. I’d get outside more and try to meet other people. Finding a job from home may be difficult but I’m sure I could go to the classifieds and call up numbers. The last time I had no computer, not even a clunky desktop, was probably sometime in 2009. It was briefly because one relative demanded that we give her our new Windows Vista computer because, quote on quote, “it was mine and you stole it from me”. That was definitely not true. I think she was just jealous that she didn’t have a good computer (an old junky Windows 98) and we did. So for a while, our family used an old junky Windows 98 until mom went and bought the computer that would begin an entirely new generation in my life: Windows 7. It was the first touch screen, all-in-one computer I ever had, and on that computer I discovered many sites that are now the entertainment hubs of the net, one of them being a very different looking YouTube. I started my first channel on there and uploaded my very first video. Filling the void left by the absence of a computer wouldn’t be that difficult. There are still many things I could do. I’ve got the piano organ and guitars I could play, video games I could kill time on, cookbooks I could get inspired by, magic tricks I could practice. The computer may be the focal point of my existence now but it sure isn’t the only thing to me. 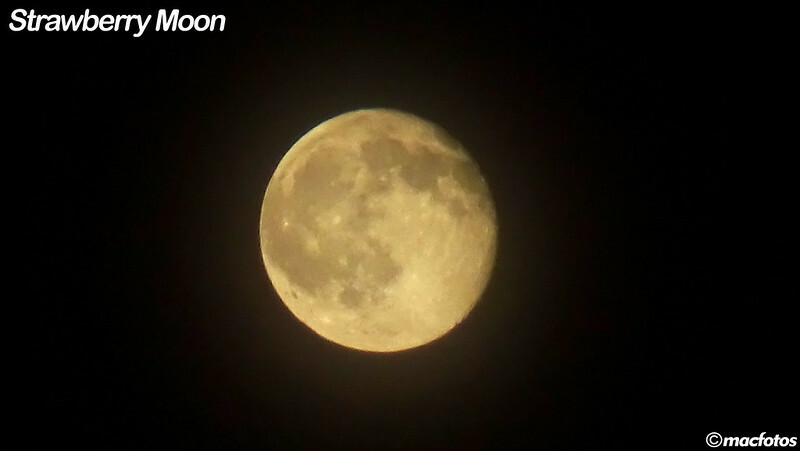 The feature picture is the full moon of January, the first one I will capture for a year long project of moons. I got multiple shots for the Photo a Week Challenge: From the Back. 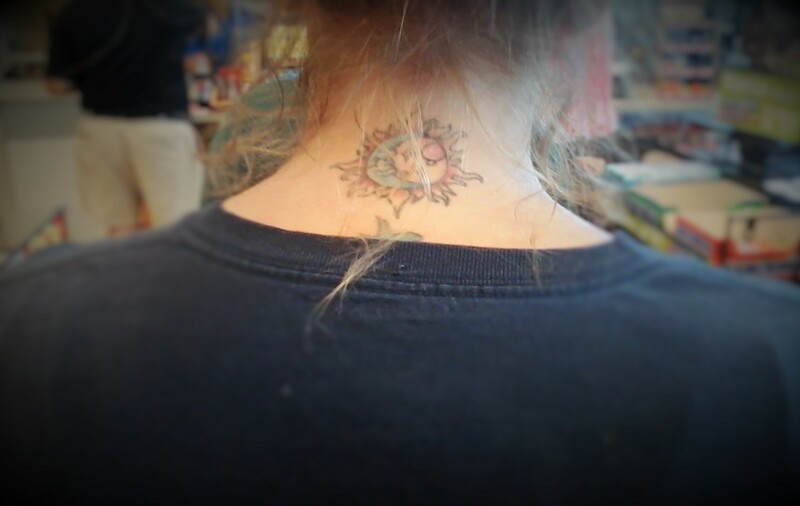 A picture I took of a tattoo on the back of a woman’s neck. It’s a sun with a crescent moon layered in it. The moon looks like a baby that’s being swaddled, the sun the mother. 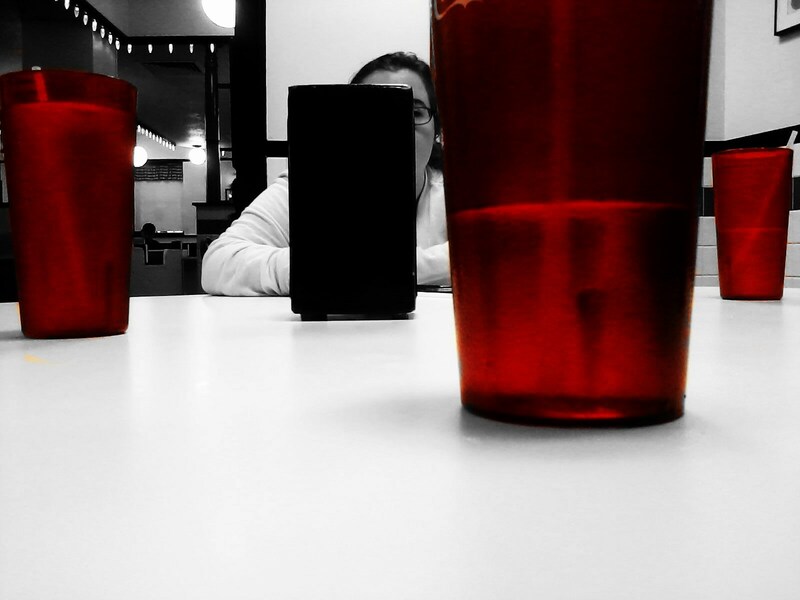 It’s interesting what you can photograph when the subject doesn’t know you’re there. 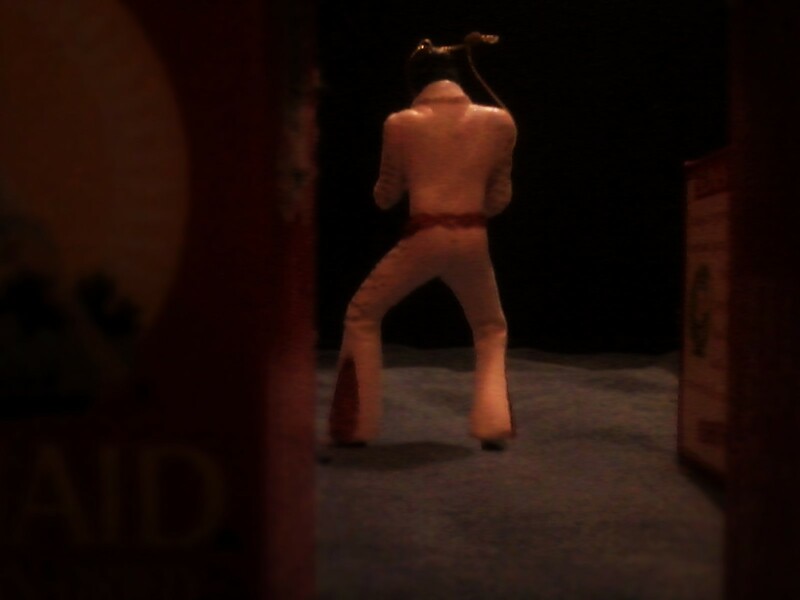 An here’s an Elvis ornament from the back. My make-believe stage concert made with raisin boxes. There is one moon in the sky that we have worshiped and counted the years by for millenia. It is the Moon, and needs no fancy name like other planets’ satellites. And if you think about the time that little rock has been up in the sky, say 4.5 billion years just like Earth, the 40 something years that have gone by since man last set foot on it seems minuscule in comparison. My moon is your moon as the same water you drank today was also drank by many people before you, including me. 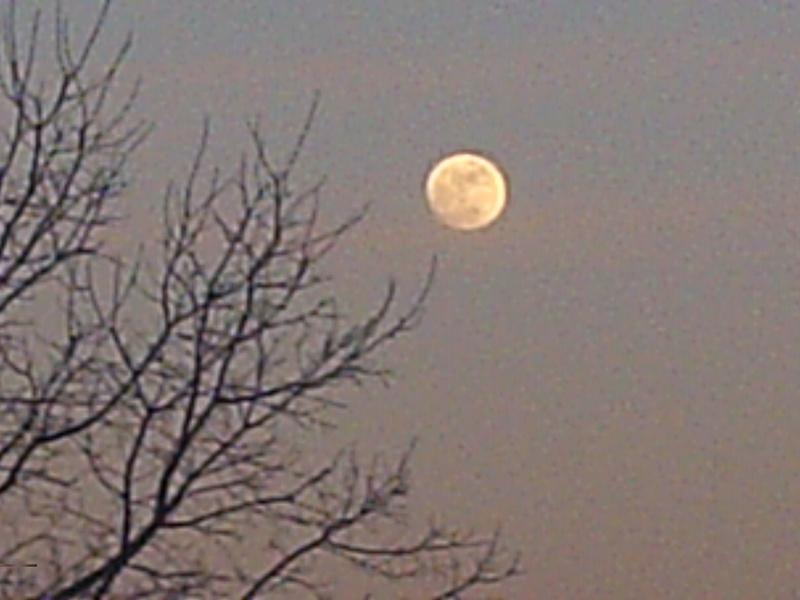 That same moon was gazed upon by ancient Greeks, Egyptians, and other civilizations. Dinosaurs probably eyed it one time or another. This is the Strawberry Moon of June that I captured earlier this month in my backyard. The best picture I’ve ever gotten of the magnificent orb to this point. I used a tripod to steady the shot and zoomed in with my HD video camera set to the photo mode and snapped a number of shots until I got one that was centered perfectly since the camera kept wobbling and getting the moon off target. 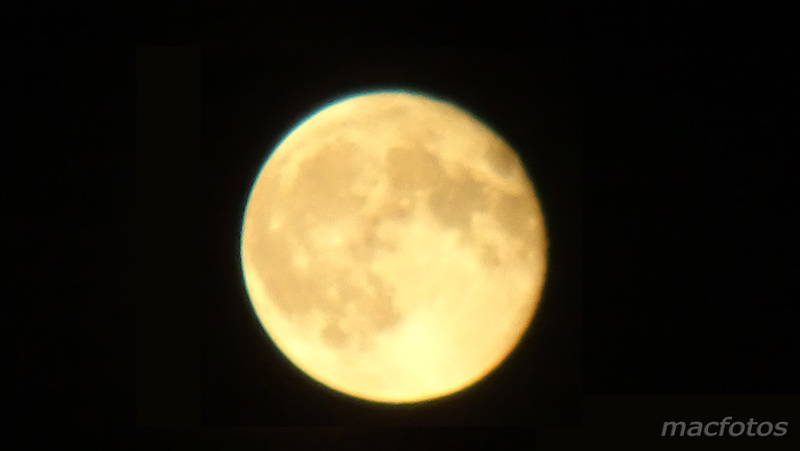 A lowering of the white exposure on my camera also eliminated that bright glow of the moon and brought out its fine details, such as the dark spots and crater marks. Isn’t it amazing how life on Earth is dependent upon this hunk of rock? Without it, our world would be very different, maybe inhabitable (for humans at least). The ice poles would shift constantly, possibly freezing organisms to death who aren’t used to it; the hot zones would also shift, possibly making Antarctica a warm place, melting all the ice and snow. It would be a Topsy turvy world, the seasons sporadically changing, Earth wobbling dangerously like a top. And somebody actually wanted to blow up the Moon…sheesh.